Product prices and availability are accurate as of 2019-04-19 03:29:32 EDT and are subject to change. Any price and availability information displayed on http://www.amazon.com/ at the time of purchase will apply to the purchase of this product. 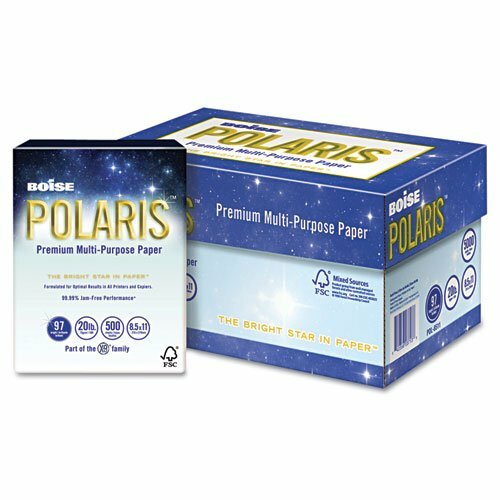 Highly versatile premium paper designed for all types of office and high-speed production equipment. Excellent runnability for jam-free printing and copying. Radiant brightness with blue-white shade for crisp text and sharp images. Optimized for two-sided printing and copying with minimal show-through. Ideal for general business documents, reports, and proposals, where a quality look and feel is important. This product was made from wood that came from a certified managed forest. Size: 8 1/2 x 11; Paper Color(s): White; Paper Weight: 20 lb; Sheets Per Unit: 5000. Paper with purpose. Letter-size reams include Box Tops for Education coupon. Compatible with all office equipment. 99.99% Jam-Free performance guaranteed for maximum up-time. This product was made from wood that came from a certified managed forest.